Park City, UT – Six-year- old Anna Hoffman sat on the bar atop of the 20-meter jump at the Utah Olympic Park in Park City. Next to her was one of the leading ski jumpers in America, Lindsey Van, offering words of encouragement. Young Anna was calm and collected, helmet and goggles on her head and skis fixed to her feet, gingerly placing them into the porcelain ski track for her trip down the inrun. It was a long way from her home jump at the Blackhawk Ski Club outside Madison, Wisc. That was a decade ago. Anna was the youngest of the girls assembled at the Olympic jumping complex for a first-ever camp with the newly named members of the debut national team which was already eager to motivate the next generation of ski jumpers. It would be nearly three years until Lindsey Van would win her sport’s first World Championship, and nearly eight until women’s jumpers would soar off Olympic jumps for the first time in Sochi. Over this past New Year’s weekend, Hoffman was back again at the Utah Olympic Park. 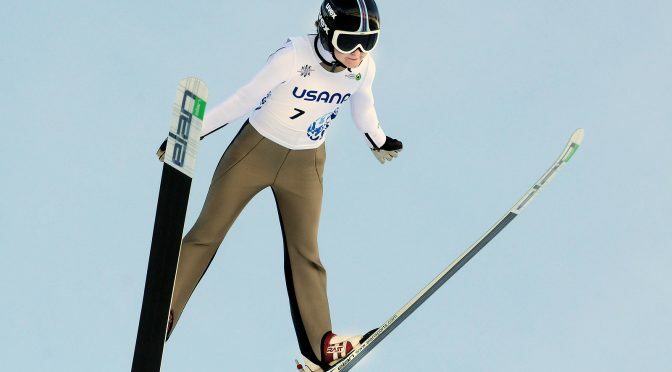 But this time she was a confident 16-year-old vying for a spot on the Nordic Junior World Championship team that will compete against athletes from around the world in Utah this February. Her early heroes were pioneering women from the Midwest – Karla Keck and Blaire Tompten – along with Lindsey Van of Park City, one of the early international stars of women’s ski jumping. There’s a great heritage for ski jumping in the Midwest that lives on at the Blackhawk jumping complex west of Madison. Hoffmann got her start on the tiny 5 and 15-meter jumps, and drew inspiration from her heroes. 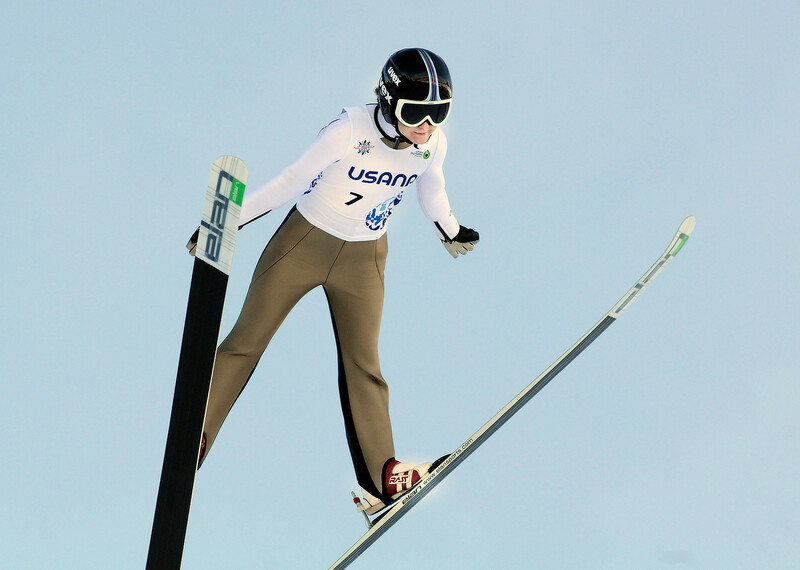 After becoming one of the top young jumpers in the USSA’s Central Division, thanks to work of her coaches at Blackhawk, she next moved up to Women’s Ski Jumping U.S.A. innovative Fly Girls program – a pathway to bridge motivated young girls up to the next level. And she eventually followed her sister’s footsteps onto the national development team. Last winter, Hoffman won the national junior title. This past summer she had her first taste of jumping overseas, with a camp in Slovenia and competition in Hinterzarten, Germany. Earlier in December, she competed in her first Continental Cup in Norway – jumping against the largest field ever in a COC event. But on a clear, cold late December morning, she was perched again at the top of the inrun – this time the Olympic HS100 meter tower, a jump that has become like a second home over the years. Climbing out onto the bar, her focus was clear. But she was scared. Making the Junior Worlds team was her primary goal this year. She knew she could jump better than she had in the Steamboat qualifier, when she was fifth. But on her final training ride the day before, she had crashed hard. Her four competition jumps over two days would be the most important of her young career. If she wanted a trip to Junior Worlds, she had to step it up. She pushed off, gliding down the track and off into the air. 86.5 meters – decent, but not enough as she stood second. Her next jump had to be better. It was – 88.5 meters to take a narrow win. The next day, it was all on the line again. With a first jump of 88.5 meters and longest ride of the day at 89.5 on her second, she swept the qualifiers. She’ll now be joining the best juniors in the world Jan. 30-Feb. 5 at the Utah Olympic Park. “I’m just really, really excited,” said Hoffmann with passion. “Being a young kid so immersed in ski jumping, I’ve always wanted to be like the other girls and go to these big competitions. It means so much to me that I can represent the USA at Junior Worlds in my country.